Karl Wolf Biermann (born 15 November 1936) is a German singer-songwriter and former East German dissident. He is perhaps best known for the 1968 song “Ermutigung” and his expatriation from East Germany in 1976. Biermann was born in Hamburg, Germany. His mother, Emma (née Dietrich), was a Communist Party activist, and his father, Dagobert Biermann, worked on the Hamburg docks. Biermann’s father, a Jewish member of the German Resistance, was sentenced to six years in prison for sabotaging Nazi ships. In 1942, the Nazis decided to “eliminate” their Jewish political prisoners and Biermann’s father was deported to Auschwitz concentration camp, where he was murdered on 22 February 1943. Biermann was one of the few children of workers who attended the Heinrich-Hertz-Gymnasium (high school) in Hamburg. After the Second World War, he became a member of the Free German Youth (Freie Deutsche Jugend, FDJ) and in 1950, he represented the Federal Republic of Germany at the FDJ’s first national meeting. On finishing school at the age of 17, Biermann decided to emigrate from West to East Germany where he believed he could live out his Communist ideals. He lived at a boarding school near Schwerin until 1955, and then began studying political economics at the Humboldt University of Berlin. From 1957 to 1959, he was an assistant director at the Berliner Ensemble. At university he changed courses to study philosophy and mathematics under Wolfgang Heise until 1963, when he completed his thesis. Despite his successful defense of his thesis, he did not receive his diploma until 2008 when he was also awarded an honorary doctorate degree. In 1960, Biermann met composer Hanns Eisler, who adopted the young artist as a protégé. Biermann began writing poetry and songs. Eisler used his influence with the East German cultural elite to promote the songwriter’s career, but his death in 1962 deprived Biermann of his mentor and protector. In 1961 Biermann formed the Berliner Arbeiter-Theater (“Berlin Workers’ Theater”), which was closed in 1963 before the production of Biermann’s show Berliner Brautgang, which documented the building of the Berlin wall. The play was officially banned and Biermann was forbidden to perform for six months. Although a committed communist, Biermann’s nonconformist views soon alarmed the East German establishment. In 1963, he was refused membership in the ruling Socialist Unity Party of Germany (SED), although no reason was given at the time for his rejection. After the Wende, documents available from Biermann’s file at the Stasi Records Agency revealed that the reviewers were under the impression that he was a regular user of stimulants, leading to the rejection of his application. In 1964, Biermann performed for the first time in West Germany. A performance in April 1965 in Frankfurt am Main on Wolfgang Neuss‘ cabaret program was recorded and released as an LP titled Wolf Biermann (Ost) zu Gast bei Wolfgang Neuss (West). Later that year, Biermann published a book of poetry, Die Drahtharfe, through the West German publisher Klaus Wagenbach. In December 1965, the Central Committee of the Socialist Unity Party of Germany denounced him as a ‘class traitor‘ and placed him onto the performance and publication blacklist. At this time, the Stasi developed a 20-point plan to “degrade” or discredit his person. While blacklisted, Biermann continued to write and compose, culminating in his 1968 album Chausseestraße 131, recorded on equipment smuggled from the west in his apartment at Chausseestraße 131 in Mitte, the central borough of Berlin. To break this isolation, artists like Joan Baez and many others visited him at his home during the World Youth Festival in 1973. Karsten Voigt, chairman of the West German Socialdemocratic Youth (Jusos) protested against the suppression of the freedom of opinion and information by the state security. In 1976, the SED Politbüro decided to strip Biermann of his citizenship while he was on an officially authorized tour in West Germany.It turned out that the Politbüro had decided to do so before the first concert in Cologne, even though this concert was used as the official justification afterwards. Biermann’s exile provoked protests by leading East German intellectuals, including actor Armin Mueller-Stahl and novelist Christa Wolf. In 1977, he was joined in West Germany by his wife at the time, actress Eva-Maria Hagen and her daughter Catharina (Nina Hagen). Now living in the West, Biermann continued his musical career, criticizing East Germany’s Stalinist policies. He was able to perform publicly again in East Germany on 1/2 December 1989 during the Wende that eventually toppled the Communist government. In 1998, he received the German national prize. He supported the 1999 NATO Kosovo War and the 2003 invasion of Iraq. In the Arab–Israeli conflict he supports Israel and criticizes that affected by antisemitic views a majority of Germans lack of both understanding and empathy for the Israeli side. He lives in Hamburg and in France. He is the father of ten children, three of them with his wife Pamela Biermann. 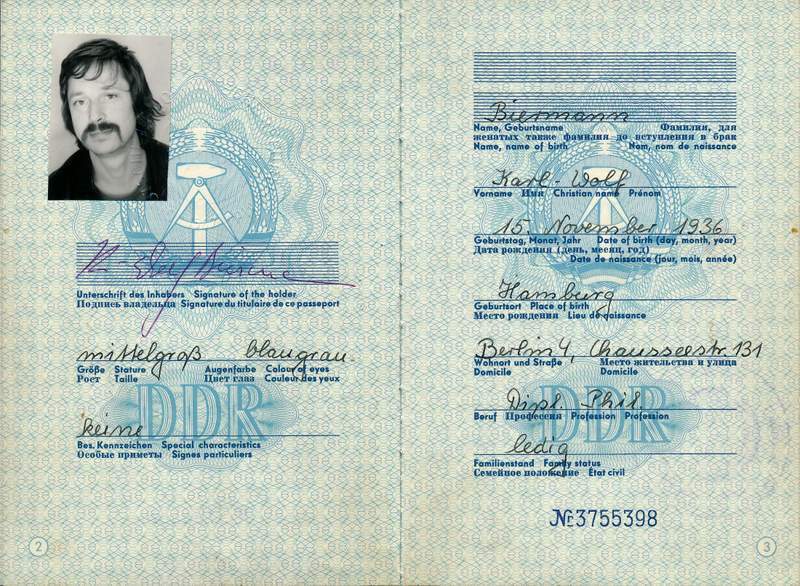 This passport is on display at the museum “Palace of Tears” in Berlin. The Tränenpalast (English: “Palace of Tears”) is the Berlin colloquialism for the former border crossing at Berlin Friedrichstraße station, where East Germans said goodbye to visitors going back to West Germany. From 1962 to 1989 it was the border crossing for travelers by S-bahn, U-bahn and train between East and West Germany. It was used only for westbound border crossings, with separate checkpoints for West Berliners, West Germans, foreigners, diplomats, transit travelers and East Germans. The term Tränenpalast derives from the tearful goodbyes that took place in front of the building, where western visitors had to say farewell to East Germans that were not permitted to travel to West Berlin. If you ever going to Berlin I recommend to go there to get a glimpse of this part of German history.